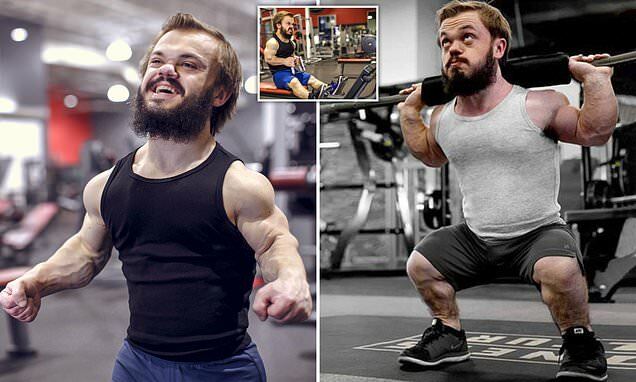 A bodybuilder with dwarfism has revealed how he's defying cruel online trolls who say he's too small to work out seriously by entering his first competition. Lee Liston, 26, from Utah, stands at 3ft 11 and weighs 87lbs (6st 2oz), and first began training in the gym just 12 months ago. After realising that people care more about his muscles than his height in the gym, he's become obsessed with training and now goes six times per week. In April, he's hoping to compete for the first time in a bodybuilding competition. Lee, a freelance actor, musician and entertainer, said: "I don't go to the gym for an ego boost, it's more for motivation and a sense of belonging. 'Anywhere other than the gym, I'm see an a little person, but when I'm in the gym I'm respected because of my muscles - I'm seen as an equal. 'I feel more on the level of others around me, when people stare it's not because I'm different, they stare because I have muscles. 'I'm feeling pretty good about my up-and-coming competition - it's pretty exciting. I'm only nervous about making sure I get lean enough while maintaining muscle!" Lee has started prep for his new, strict diet regime and claims he doesn't struggle staying on track. As part of his training, Lee 'bulked' for three months where he ate 1855 worth of calories a day - double the amount that he requires for his height and body mass - as well as 104g of protein. He added: 'I don't really like bulking because I love looking lean, so it can be hard.